In the past year, our travels have taken us to many beautiful, interesting, and new to us places in this country. Today we headed to a place that seems like it has always been a part of my life, The Naismith Memorial Basketball Hall of Fame in Springfield, MA. My earliest memories seem like basketball has always been an interest of mine. From first learning to dribble as a toddler all the way till today, where stepping on a court to shoot leaves something on me sore and aching. (There was a sobering reminder of this fact at the end of our tour at the Hall!) So when our travel plans put us in Connecticut for a couple of nights, only an hour from Springfield, MA, we decided a trip to the Hall was in order. Now Betsy is more of a baseball / softball girl, but she has easily adapted to being a student and fan of the game of basketball. Ok, so we both like sports, ‘nuf said! The current version of the Basketball Hall of Fame opened in 2002 and is home to nearly three hundred inductees and more than 40,000 square feet of basketball history. Located on the picturesque banks of the Connecticut River, the new museum is a fitting shrine to the game Dr. Naismith invented more than a century ago. The landmark structure is one of the world’s most distinctive monuments punctuating the Springfield skyline and stirring the spirits of basketball fans everywhere. As a child I visited the Basketball Hall of Fame in one of its former locations. What year that was, I have no idea. If someone (probably in my immediate family) remembers what year I visited the Hall, could you please let me know? Betsy asked me that question and I have no recollection of what year it was or how old I was. I am certain it was prior to 2002, so I was never at its current location. After navigating the drive through Hartford and north to Springfield we easily located the Hall in its prominent spot between I-91 and the Connecticut River. Since it was a weekday, we anticipated a light crowd and we were correct. All the better for us! My talented, deal-searching wife snagged a Groupon deal for our admission and got us both in for a total cost of $14.25. (Normal admission prices - Adults = $24.00 Youth (Age 5-15) = $16.00Seniors (Age 65+) = $18.00Children (Age 4 and under) = Free) There are several restaurants and a couple of bars integrated into the building in case you plan on making your visit a full day. We headed right into the Hall. We were greeted by a friendly employee, Gary, who led us up to the third floor of the building where the Ring of Honor is located. The entire building is located inside a dome-like structure that resembles, duh!, a basketball! 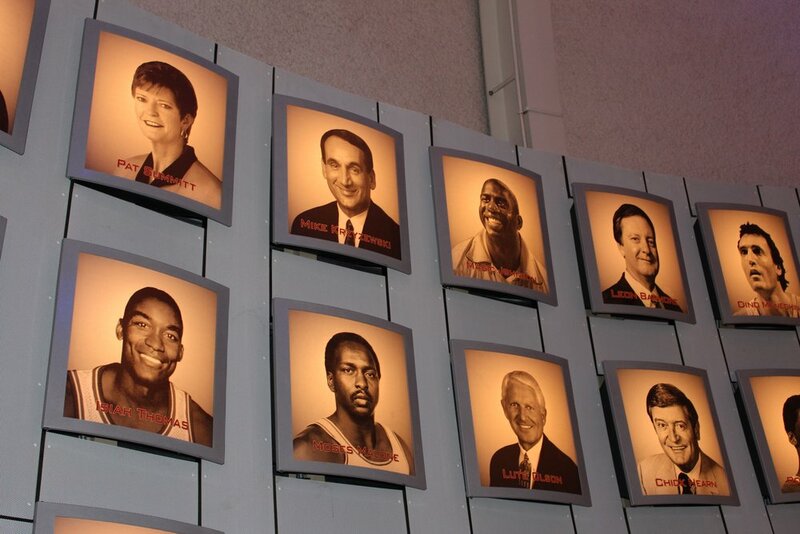 The Ring of Honor contains a photo and short bio of the almost 300 inductees of the Hall. Even though most of the names were familiar to me, there were still many names which were a major part of the game’s history which I was not aware of. Betsy and I spent some time circling the Ring and enjoyed some reading and learning. The entire Ring of Honor looked down onto the centerpiece of the Hall, the Center Court. A full-size court which the entire Hall is built around. We walked down some steps to the second level where the history of the game is on display. There are thousands of pieces of basketball history on display. Our employee friend, Gary, even brought Betsy one of LeBron James’ shoes on display at the Hall to hold and photograph. Besides the displays on this level, there are also some interactive games and displays to participate in. There was even a display where you could measure your vertical leap. So of course Betsy and I had to try it out. It brings things into perspective when you watch these spectacular athletes on television and they talk of 35, or even 40 inch vertical leaps. And then you record your own, jumping as high as you can, and it comes out to be a measly 15 inches. (Betsy’s was 14 inches!) So yes, we both have proven we have the skills to jump over a phone book. Maybe not the Manhattan phone book, but most phone books. Do they even print phone books any more? Another topic for another post. Hoop Hall was great way to spend 3 or 4 hours, and definitely worth a stop for any basketball fan. Love live basketball and may the Naismith Memorial Basketball Hall of Fame continue to thrive. Thank you Dr. Naismith for creating the game I love!